Federal agents conducted a multi-state worksite raid at several Midwestern agricultural businesses on Wednesday, arresting more than 100 people including owners and supervisors who allegedly conspired to employ illegal aliens at the expense of American workers. 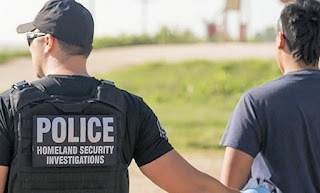 Homeland Security Investigations — the investigative arm of Immigration and Customs Enforcement — led the operation against at least 11 companies in Nebraska and Minnesota, The Grand Island Independent reported. Along with more than 130 suspected illegal workers, agents arrested 14 business owners and managers for allegedly using bogus Social Security numbers to build a workforce of underpaid, exploitable illegal immigrants. Three other people involved in the scheme were also indicted but not taken into custody during the operation. The operation was one of the largest worksite raids in HSI’s 15-year history, according to Tracy Cormier, the special agent in charge of the agency’s St. Paul field office, which covers Minnesota and Nebraska. This is truly pathetic. Why don't they leave businesses the hell alone. American's don't want this work. This is insanity. And Cruelty.